I feel a bit of a fraud writing about Turkey, as I’ve only spent a couple of days there, on seperate occasions, when our cruise ship called at a Turkish port. Nevertheless, we managed to pack a lot into those two days, especially the first one, when we put into Kusadasi. We signed up for a coach tour, which was to take us to the ancient city of Ephesus, calling, on the way, at the Temple of Artemis, which is in ruins, but still beautiful. And, we heard, not for the first time, that there are more Ancient Greek and Roman ruins in Turkey than there are in Greece or Italy. Then, it was on to the home of the Virgin Mary, now a Roman Catholic church. Mary had been given into the care of St. John by Jesus at the Crucifixion, and it was here he brought her. And, I think what impressed me most was how the Muslim guide spoke of Mary and St. John with all the respect and reverence a devout Christian would. There was no ‘It is said …’ or ‘… is supposed to’ about his presentation, either. On the way back to Kusadasi, we stopped for a meal at the National Railway Museum at Camlik. None of the locomotives was in steam; in fact, I doubt if some of them could be steamed without serious risk of explosion. But, they look imposing nevertheless. Most of them are of German origin, and they are monsters. They needed to be, for most of them date back to the Ottoman Empire, which, at its height, stretched from the Adriatic Sea to the Arabian Gulf. 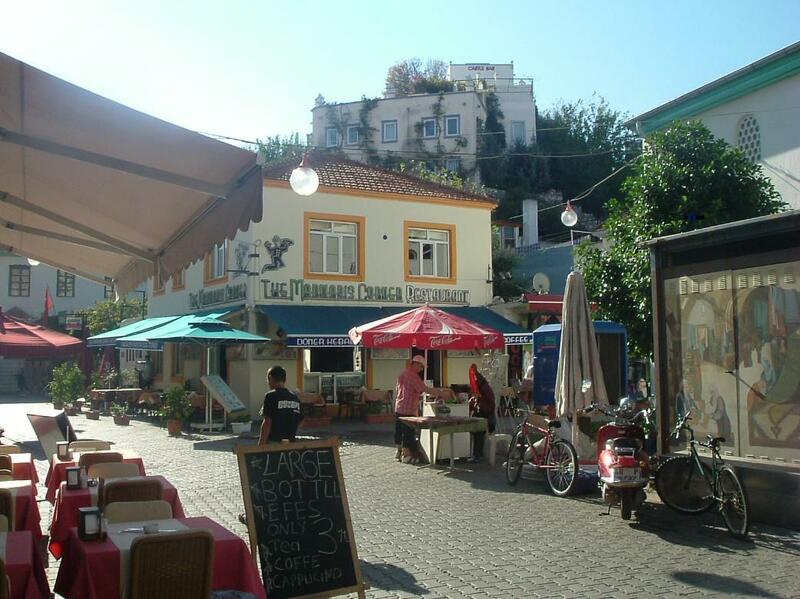 When we visited Marmaris two years later, we immediately noticed an important difference. At Kusadasi, we’d given the guide a two million lira tip. Now, he would get two lira, for, in the meantime, Turkey had revalued its currency by simply deleting the word ‘million’. Not that it mattered; in just about every shop, stall and café we visited, they quoted prices in Euros. So,we just looked around Marmaris instead … especially the extensive market. We bought shirts and sweaters with the Lacoste alligator on them. We thought at first they couldn’t be genuine at the price they were being offered at … but it’s possible they could be ‘factory seconds’. We found small faults on some of them, but nothing that couldn’t be fixed with a few seconds with needle and thread. The best bit was admiring the boats in the harbour. Many of them were traditionally-built gulets, and many of the gulets are built, or converted for the holiday trade. And, we’d like to try a cruise on one as soon as we can.